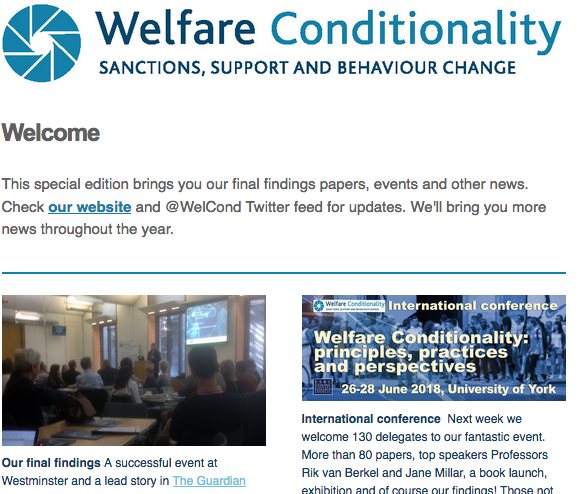 Welfare Conditionality » Conceptualising and Justifying Conditionality? The first event of the research project ‘Welfare Conditionality: Sanctions, Support and Behaviour Change’ takes place on Wednesday 11th December. The international expert panel includes Professor Lawrence Mead (New York University), Professor Doctor Sigrid Betzelt (Berlin School of Law and Economics), Dr Chris Grover (Lancaster University) and Professor Hartley Dean (London School of Economics). The panel will be presenting their views on ‘Conceptualising and Justifying Conditionality?’. The event is designed to bring together a range of international experts with differing perspectives on the justification of welfare conditionality, in order to inform and critically interrogate the project team’s thinking before fieldwork commences. ‘Welfare Conditionality: Sanctions, Support and Behaviour Change’ is a major five year programme of research funded under the Economic and Social Research Council’s Centres and Large Grants Scheme, running 2013-2018. The project aims to create an international and interdisciplinary focal point for social science research on welfare conditionality and brings together teams of researchers working in six English and Scottish Universities. Central to our work is a desire to inform international policy and practice through the establishment of an original and comprehensive evidence base on the efficacy and ethicality of conditionality across a range of social policy fields and diverse groups of welfare service users.